Location/ Directions: I-81 exit 222, I-64 W. Staunton exit. Hotel is located on US 250. About Hotel: 5-Floors, 96-Rooms, Interior Corridors, Free wireless high-speed Internet access in all rooms, Free breakfast, Free weekday newspaper, Outdoor pool, Pet-friendly hotel (fee), Bus Parking, Elevator, Cable/Satellite TV, Hair Dryer, In-Room Coffee Maker, In-Room Desk, Iron & Ironing Board, Microwave, Refrigerator, Voice Mail. Railroad View: Good View. Any 4th or 5th room floor on the front of the building will offer the best railroad view. Railroad end of the building will be best. The tracks are about 6 feet below parking lot level. Some light brush along the railroad tracks do not foul the view from the motel. The parking lot is a fine place to photograph passing trains during the AM hours, the late afternoon light creates poor photography from the motel. Railroads past Hotel: Buckingham Branch Railroad / CSX Transportation (trackage rights for westbound empty hopper trains) / Amtrak (Cardinal). CSX uses Buckingham Branch Railroad to run westbound empty hopper trains. Expect around 12 trains a day during a 24-hour period. Railroad Radio Frequency: 160.455 (Buckingham Branch Railroad Dispatcher). Location/ Directions: I-81,exit 222, take left onto Rte.250 East, hotel is 1/3 mile on left (Just north of the I-81 and I-64 interchange). 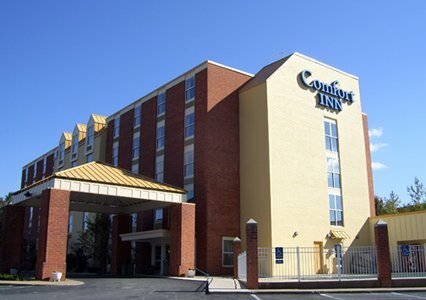 About Hotel: 4-Floors, 87-Rooms, Interior Corridors, Bus Parking, Elevator, Free Coffee, Free Continental Breakfast, Free Newspaper Mon-Fri, Outdoor Parking, Pet-friendly Hotel, Cable/Satellite TV, Free Local Calls, Free Wireless High Speed Internet Access, Hair Dryer, In-Room Coffee Maker. Railroad View: Excellent View! Any room on the front of the building will give you a railroad view. Odd number rooms are needed. Tracks are just across the highway. The motel windows do not open. Trains do not blow their horn in the area, but you can hear them pass. At night, you can see passing trains, but it's too dark to video them. 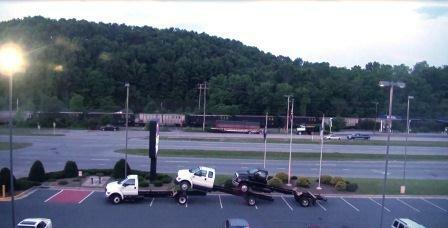 This motel provides the best view of the railroad in Staunton. Notes: Within walking distance; McDonald's, two convenient stores/ gas stations. Several other food places are a short drive away. Floor Plan: Any odd numbered room will land you a railroad view. 2nd to 4th floor rooms will keep you above the parking lot. In the floor plan, replace the "x" with the floor number, second two digits provide the room location. Middle Photo: Looking out from a first floor room near the west side of the building (Room #123), a westbound coal train can be seen from the Sleep Inn motel. Higher floor rooms are best to keep above automobiles in the parking lot. This is a late afternoon photo when the parking lot was almost empty. Bottom Photo: A photo of a passing CSXT empty hopper train was taken from room # 407. This room provided a great view. This image was captured at 5:48am via a video. This was the last train that past prior to my departure at 10am. During my stay from 7:30pm to 10am, four trains passed (unless I missed some trains overnight). The trains I saw were at 9:21pm, 10:45pm, 12:01am and this train at 5:48am. All four trains were westbound CSX empty hopper trains powered by two CSX GE wide-nose locomotives. Location/ Directions: Take Interstate 81 to Exit 222. Turn left onto US Route 250 East. 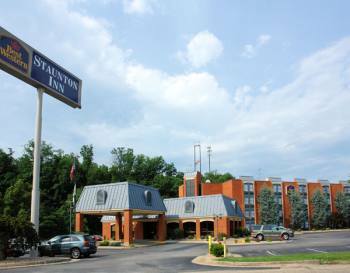 The BEST WESTERN Staunton Inn is located on the right. About Hotel: 4-Floors, 80-Rooms, Interior Corridors, Complimentary Breakfast, Pets Allowed, High Speed Internet, 100% smoke-free hotel,Indoor pool Heated, Glass Elevator, Free parking, Satellite television, Free local calls, AM/FM alarm clock, Coffee/tea maker, Hairdryer, Iron, ironing board, Air-conditioning, Microwave available, Refrigerator available, Pets Allowed. Railroad View: Fair to poor view from rooms on the rear side of the motel. Pine trees behind the motel take away from what would be an excellent view of the railroad. However, first floor rooms on the rear of the motel offer a good view for trainwatching, as you look out from under the tree's. For those who like to photograph and video, a step outside the motel offers a great shot of trains on the double track line. During my visit, at times empty hopper trains may stop behind the motel, with the power just out back of the motel. Photo Comment: The photo to the right shows the back side of the motel with a westbound CSX freight train about to pass. The view from this parking lot is great, better than I can say about the view from the rooms. Below Right: When you hear a train coming, take a step outside, nice pictures can be captured behind the motel. This westbound CSX train was actually stopped waiting for an eastbound train. This railroad is double track behind the motel. Below Left: A view from a first floor window can be better than the higher floor rooms, mostly because you are looking under the trees for a railroad view.